Shazam, the seemingly magical app that can figure out what song is pumping out of the restaurant’s PA system by just listening to it for a few seconds, is now available for the iPad. The cleverly named Shazam For iPad from Shazam Entertainment is free, and also includes unlimited song tagging—a feature now lacking from its iPhone counterpart. However, unlimited tagging is a “launch offer,” and will be only be available if you download the app in the near future; precisely how near isn’t quite clear. Shazam for iPad takes advantage of the extra screen real estate on Apple’s latest device: new, single-screen layouts for browsing tracks and artists should enable you to skim through more new music faster than you can in the iPhone version. When you tag tunes with Shazam, the app will let you send updates to Twitter or Facebook, or to e-mail a digital postcard. And, of course, any time you successfully tag a tune in Shazam, the app offers a helpful link to go buy the full song in the iTunes Store. 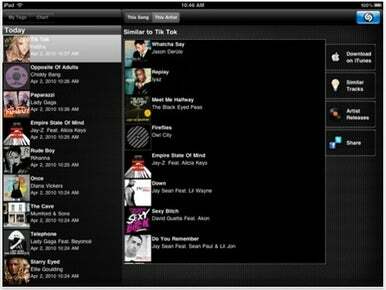 Rounding out the app’s feature list are music recommendations, which are based on the songs you tag, along with other fun information to explore, like album reviews, artist biographies, and song lyrics. Shazam for iPad requires iPhone OS 3.2 or later, and, unsurprisingly, an iPad.